This car was first completed in 2011 and was back on the road for a year but we just decided to take it to the next level. Previously we added a new tweaked 428 CJ engine. It had approximately 470 HP. Has Edelbroch aluminum heads and intake. Runs stock exhaust manifolds and a newly rebuilt C6 Transmission through a 3.50 positraction rear end. 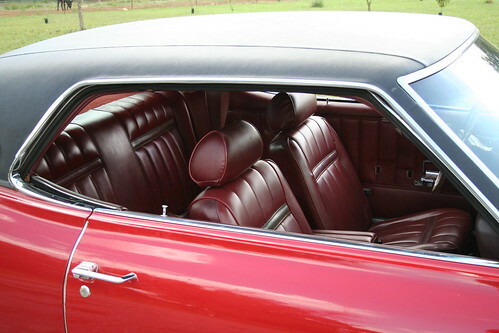 The interior is in acceptable but not but not quite up to our standards. The picture to the left was taken 2010 when we first dropped if off the trailer in our storage building. After playing with this beast for a year we decided it would be better to dial it back a notch and do it a little more like a “Day Two” car. Since a 428 CJ with air is a rather rare car we thought about taking it back to all stock. Because we still intend to drive this car a lot that concept was soon tossed out in favor of the Day Two approach. What is a Day Two car? Basically, it is what the car may have been like a few weeks after the new owner got it home and made some minor bolt on modifications to personalize his car. With that in mind we pulled out the radical “thumper” 428 CJ and will be installing a date code correct 428 CJ. We will keep the after market valve covers and air cleaner but the engine will be correct in other respects. Once we got the engine out we found a little previous damage on the front end. All new sheet metal for the shock towers forward incuding new radiator support will be added. The body is remarkably rust free and very straight making the respray a little easier. The old paint was not bad but just not up to our standards so rather than touch it up we went for doing it right. All the paint was removed down to bare metal and started over! The minor flaws in the interior will be repaired, new head liner installed and the entire interior tinted to bring back the factory fresh appearance. Next up will be a new base coat clear coat paint job in the original factory color plus all new chrome bumpers and trim. 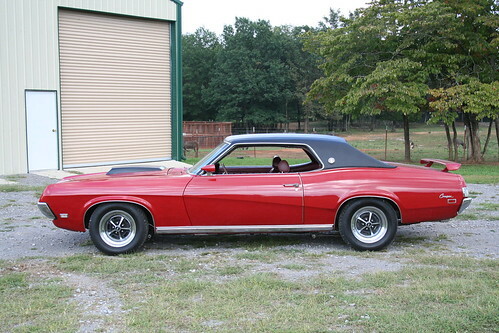 A set of 15″ Torque Thrust Mags may make their way on to the Cougar as well. The underside will get a driver quality detailing. This is the engine that was replaced with a factory spec date code correct 428 CJ. This old engine has a wild cam and you will love the sound. This cat has a mean purrrrrrr. To hear what it sounds like click on the audio below. On Labor Day weekend 2010 the car went to its first cruise since getting the new motor. It has been sitting for years. Here are a couple of photos of what the car looked like prior to the most recent restoration! To see and read more about this car you can now go over to our Museum/Private Collection page, Click Here. To see a more recent update on this Project Cougar, Click Here. 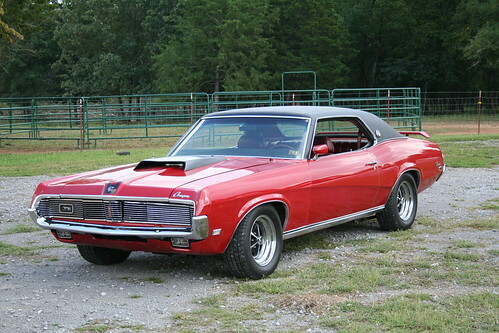 My sister had a 69 Cougar xr7 with the 390 auto.,why i don`t know,gas mileage sucked and she traded it for a 66 galaxie.Dad was a Big Ford Guy.36 ford(growing up),them married and bought a 50 ford,then a 54 w/overdrive,the a 57 country sedan w/312,then a 63 wagon with a 302,then a 59 custom and a 65 Galaxie 352,(got wrecked),(found a 65 with a 427)but too big engine!Got a 65 custom and switched interiors,then a 66 custom, then 72 Mavericks faze,then 72 Torino and the 76 f250(Camping),then a LTD and a 78 f350 then sold and bought a Taurus?..Later both passed away,so We were a Ford Family for a long time,except for a(53chevy)MY Brother was a 64 Impala SS man.LOL. That engine sounds very nice and agressive. Congrats. 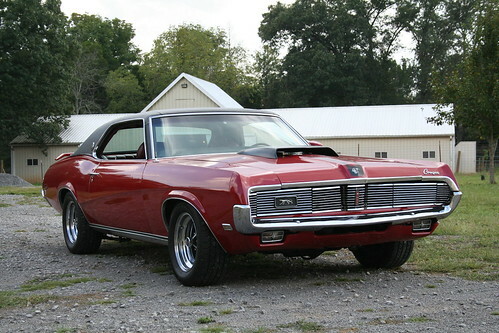 I have a 69 cougar 428cj-r also, completely restored to original standards. Allthough it is for sale right now, no market in Belgium, so i guess i have to ship it to the US someday.